- The zoo consists of a large rock which, combined with the six fence elements, forms separated monkey and penguin enclosures. - Two separate caves are located inside the rock, accessible from two different entrances. 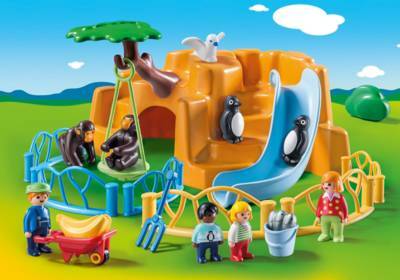 - The functioning swing for the monkey can be attached to the tree. - The wheelbarrow can only be pushed by a 1.2.3 adult figure (child figure not possible due to its height).